After Mike and I completed the Country Music Marathon in Nasville, Tn, at the end of April, 2013, I was ready for a change. A good friend of mine had been a BeachBody Coach for a while, and I had been following her posts and workouts on a daily basis. I was intrigued by the workouts she was doing and thought I might like to give one of them a try. One of the many workout programs BeachBody sells is Insanity. I started reading up on Shaun T., the creator of this workout program, and what it involved and thought it sounded like something I’d like to do. Afterall, I had just spent over 4 months training for a 26.2 mile race doing most of my training in the middle of winter in Northern Iowa…how hard could a workout DVD be that I do in my own home??!! Well, let’s just say it was harder than training for the marathon 🙂 After returning home from Nashville, I started the 60 day Insanity workout program. I also started drinking Shakeology for one meal a day. I was immediately hooked. Two months later I became a coach myself. I knew I couldn’t go another day without incorporating these products into my life and, being the fitness fanatic I am, I wanted to be able to help motivate and inspire others throughout their own fitness journeys. I loved that I could get a great workout in my own home without having to go to a gym. Shaun T.’s workout program not only worked out my cardiovascular system but also focused quite a bit on strength. In the fall of 2013, I started doing Shaun T’s new workout program Focus T25. This is probably my favorite by far because all workouts are only 25 minutes a piece. Although they are shorter, quality is not sacrificed. I felt like I would get a better workout doing a Shaun T. workout for 25 minutes than I would going for an hour run. After doing BeachBody workouts fairly consistently over the last 9 months, along with still being able to fit in my running, I have more muscle than I have ever had. I’m cutting down on body fat and I actually have abdominal muscles for the first time in my life. I strongly believe this is a result of focusing on interval and strength training through these workouts and by maintaining a healthy diet, thanks to Shakeology. I can drink my Shakeology for breakfast or lunch and not need a snack and feel full until my next meal, which used to be unheard of for me. More importantly to me is that Shakeology is a Powerhouse of Superfoods that are key to helping me maintain a healthy quality of life long into the future. These days its more important to me to feel healthy, strong, and energetic than skinny. I want to be around for a long time to spend many wonderful years with Mike watching T.J. grow into a young man and pursue all his dreams. I feel the nutrients I get from Shakeology, along with trying to eat healthy for my other meals, will help me do this. BeachBody offers a variety of programs for all levels of fitness. I also like that many of the workouts have ways to modify the moves if you can’t quite do them the way the instructors are and you don’t have to feel embarrassed because you are in the comfort of your own home. These days, I’ve been doing a hybrid of workouts that involve running, Insanity, and T25. I’ll do a post on this workout schedule soon. If you are feeling less than inspired to workout or eat healthy, I’d love to be your free coach and help motivate you. 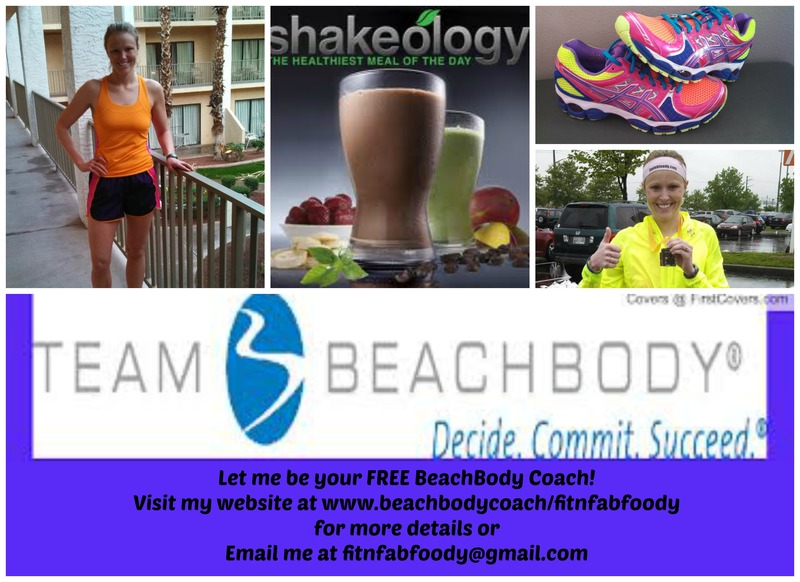 By visiting my site at www.beachbodycoach.com/fitnfabfoody , clicking on ‘Join’, and filling out some information I will become your free BeachBody coach. I can help you pick out workouts and nutritional supplements that will work for you. Now is the time to take the step in the right direction towards a healthier you. Together we can do this!